15th April, 2010: FISHING REPORT: Port Alberni Inlet, Barkley Sound, Ucluelet (West Coast), Somas-Stamp River System. 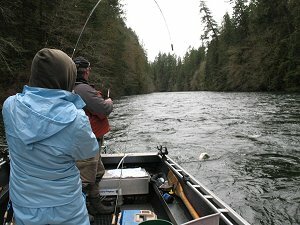 The spring and summer salmon fishing for the 2010 sport season is closing in on us. How time does fly. The 2010 season on the West Coast of Vancouver Island (Ucluelet) and Barkley Sound is forecast to be remarkable. The Sockeye and Coho returns to the Somass-Stamp River System are forecast to be better than 2009 which was incredibly good. Chinook returns to the Columbia River are predicted to be well over 700,000. In fact Chinook migrating to Watersheds to the south of this area are forecast to be 500,000 Chinook in the early spring run and 700,000 in the summer run. The early spring Chinook will migrate in April, May, and June. Some of these salmon have already been seen in northern and central Vanocuver Island waters and most recently along the surf line of Barkley Sound. With this number in mind (1.2 million) mixed in with Coho and then returns of Chinook and Coho to streams and rivers located in Barkley Sound, the Port Alberni area and other areas of the Pacific Northwest it should be fairly easy to hook into some great sport salmon fishing during the spring, summer, and early fall of 2010. Anglers world wide will be treated to some world class salmon fishing along Vancouver Islands British Columbia’s West Coast and Inlet Areas. Not only will there be some great salmon fishing but the scenic views are breath taking for those that have and have never visited and fished for salmon on Vancouver Island. Vancouver Island’s west coast, the protected waters of Barkley Sound the Alberni Inlet are noted for rugged coastlines, wonderful exquisite and secluded beaches and pristine calm waters. With all of this in mind are the rugged mountain peaks of the Island and the B.C. Coast Mountain range in the background. The scenario sets up some great days ahead on the water. The early spring weather has not been great on Vancouver Island. The last few days of March and early April delivered some torrential rain and high winds which produced very high surf. Any fishing on the coast and out of the Ucluelet Harbor had to be cancelled and even areas of Barkley Sound especially on the surf line were difficult to fish. However the weather pattern has changed and the last few days have had some great days with warm sun-filled afternoons. 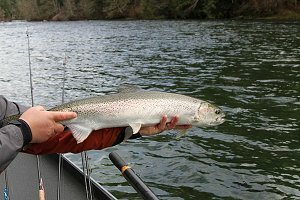 The Stamp River still has had some remarkably great winter Steelhead fishing. However by mid month we will wrap the season up. Barkley Sound and areas around Bamfield and also Ucluelet are actually fishable year round. There are times during the winter and spring when the Pacific is at rest and the smallest of sport boats can enjoy time on the water. This past year has not been any different. Early results have produced some bigger Chinook than most winters and early spring. The first derby of the year, the Sproat Loggers Derby saw a 29 and 27 pound Chinook win first and second place. The 2010 salmon fishing season will be one to remember. Summer fishing in the Port Alberni Inlet should get underway by mid June for Sockeye salmon. 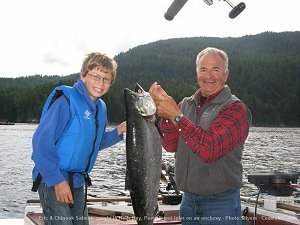 Sockeye fishing has become a very popular sport fishery and is fun for everyone from the most avid and trophy hunting fisherman to the beginner. For children it is also fun and never creates any boredom. The fishing is in very protective waters and the action can be mind boggling. There are times when two, three and even four sockeye can hit the rods which can create havoc for all. The forecast for returning Somass River Sockeye is better than 2009 which was one of the best seasons since 06. Early preliminary returns are expecting 600,000 to 700,000 sockeye to make their way up the Port Alberni Inlet and into the Somass before making their way to Sproat and Great Central Lake. Sockeye travel the Inlet in shallow water and swim into the river system fairly quickly. However when the water in the Somass warms to 18 degrees Celsius the sockeye slow down and move to deeper water and school in reasonably big numbers. The sockeye usually school in various areas around China Creek. Cous Creek, Lone Tree, the Narrows, Underwood, Dunsmuir and the Franklin-Nahmint area are several hotspots in June and July. Sockeye limits should be four per person per day with a possession limit of eight. Sockeye fishing often continues into early August. By mid August the Chinook begin to show up in the Inlet as they make their way to the river system. 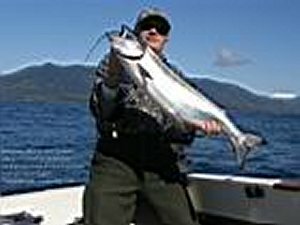 Chinook and Coho sport fishing continues to mid September in the Port Alberni Inlet. Prawn fishing is currently taking place in the Inlet as a sport fishery. The China Creek area is also a very popular area for prawn fishing. The sport fishery should continue into early May and then the commercial prawn fishery gets underway. Barkley Sound is a very popular fishing area that has accessible fishing waters year round. The waters of the Sound are protected and are very rich in bait fish which brings in summer Chinook and Coho Salmon making their way down the rugged coastline of Vancouver Island. The migratory salmon in May, June, July, and early August come into the sound and viciously feed on needle fish and sardines. This often creates some fantastic sport fishing especially along the surf line. Places like Effingham, Cree, Austin Island, Edward King, Kirby point, Beale and Swale Rock should produce some great sport fishing with 1.2 million Chinook making their way to southern watersheds. Some effective gear to use early in the year will be blue/green needle fish hootchies, anchovy in clear and chartreuse Rhys Davis Teaser Heads, various coyote spoons in watermelon, army truck, and green-glow. These fish will be found in deeper water but there will be spots where they are shallow. Often 80 to 120 feet is a popular depth but places like Austin and Cree can often find some Chinook and early Coho in 35 feet of water. The current fishing has produced some good sized feeder Chinook. Over the past weekend Ship Island and Edward King produced some hatchery Chinook weighing 20 to 25 pounds. These salmon were probably the first of the early Columbia summer run. The Chinook around Ship Island were in shallow water and were taking anchovy in a green and clear Rhys Davis Teaser head. Needle fish hootchies and a four inch green-glow coyote spoon were also very popular lures for guides and sport fishermen. Hotspot flashers in green mirror have been popular as have purple haze, and the green haze flashers. Inside waters have had some nice feeder Chinook weighing 8 to 15 pounds. The protected waters of Samatao Bay have had some nice feeders in shallow water. On Friday one angler and his fishing friend picked up 4 Chinook on a white AORL 12 hootchie in 60 feet of water. The area of water between Pill Point and Vernon Bay has been producing some great salmon and prawn fishing. Year after year Ucluelet continually produces some of the best salmon fishing on B.C.’s west coast. The last several years has produced some unbelievable salmon fishing for those brave enough to venture the offshore waters. This year predictions are indicating that 2010 will be the best fishing year in the last 60. One great indicator is winter fishing results. This past winter the abundance and the size of the Chinook have been fantastic. 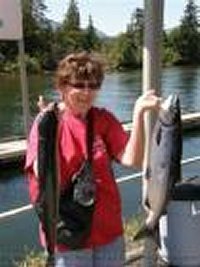 The salmon are in good numbers and have been averaging 3 to 5 pounds heavier. The best fishing to date has been around Great Bear, Mara Rock, Sail Rock, and the Lighthouse. Most of the fishing success has been with the use of small and medium sized anchovies in clear, UV, and chartreuse Rhys Davis Teaser Heads. Needle fish hootchies in blue/green continue to be hot as are the green-glow four and five inch coyote spoons and the army truck hootchie. One guide has had a lot of success using the purple haze hootchie behind a purple ultra violet flasher. Halibut fishing is very popular and there has been some good catches close to the Ucluelet Harbor. Sail rock has produced some great catches in the early season. There definitely is a lot of hype going into this season. Offshore bank Chinook and halibut fishing will needless to say be unbelievable. 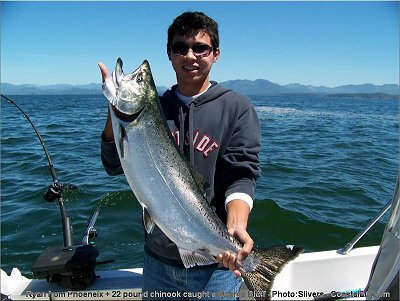 Chinook and inshore Coho fishing will also produce for all anglers some exceptionally good salmon fishing. April and early May is a time when we offer a Seafood Safari. Guests can enjoy a wonderful day on the Pacific fishing salmon, bottom fish, prawns and crab. The seafood dinner with some great B.C. wine is a great ending to a great day and opportunity. The Winter Steelhead season is come basically to an end. The current season was one of the best over the last four or five years. Those on the river the last few weeks have continued having some success. The Upper River has produced some chrome fish. Many of the fish are now making their way back to the Ocean. They have spawned out. With returns looking very favorable back to the Somass and Robertson Creek Hatchery the Fall Fishing for Coho and Summer Steelhead is looking better than 2009. Those interested in fly fishing for Summer Steelhead should look into coming to the area beginning about mid October. Those keen on Coho and Steelhead should note that the best fishing gets underway by mid September.